This review first appeared in the April 10, 1985 issue of The Daily Aztec. With the release last year (1984) of "Balls to the Wall," Accept established itself along the Scorpions and Def Leppard as kings of heavy metal. 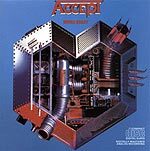 "Metal Heart," Accept's latest offering, doesn't offer the same depth of material as "Balls to the Wall," but it still contains some excellent songs. The first single, "Midnight Mover," is a strong rocker led by vocalist and Teutonic madman Udo Dirkschneider. His outrageously loud shrieks are an Accept trademark, and are just as prominent here as on the last album. Guitarist Wolf Hoffman provides simple but loud accompaniment, and Stefan Kaufmann keeps a steady beat on drums. Other songs of note are "Screaming for a Love-Bite" (which has a Scorpions-like melding of pure melody and hard rock attitude), "Wrong is Right" and "Dogs on Leads." "Metal Heart" isn't a top-to-bottom classic the way "Balls to the Wall" was, but it's a strong follow-up with several songs likley to get stuck in your head.